Resistance isn’t always futile. Sometimes it stops progress for years. 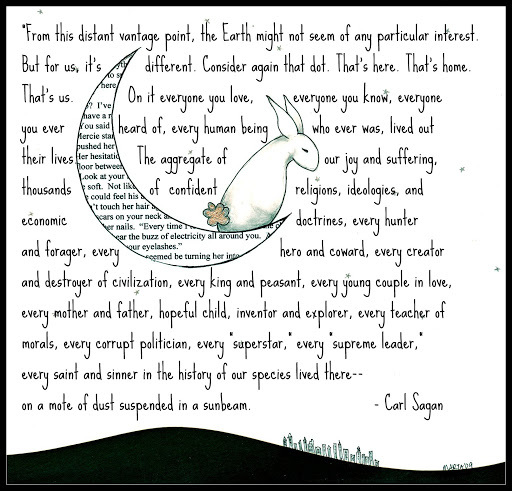 Carl Sagan + my art! I’ve been ignoring my blog. Maybe I mean neglecting. I’m supposed to be figuring a website for my art and all that. People ask me, “Do you have a website?” I feel most failure-esque to say, “I have a blog.” I mean, you can’t sell art on this thing. Sure, someone could leave me a comment about the art and we could go from there, but I don’t have a pretty page with all my images and stuff. It shows a distinct lack of entrepreneurial spirit. But I did make all that art that is hanging in my show. I did make the art, frame it or come up with a way to display it, get a show date, and hang the stuff. And I’m editing my novel that my publisher is going to put out into the world in February. I’m participating in NaNoWriMo again too by the way. I’m teaching 20 hours a week. I’m going to speed skate practice. I’m illustrating a children’s book for my publisher. I’m spending time with my kid and doing most of the housework. I’m neurotic, insecure, and obsessive. I’m not lazy. But I cannot get myself to organize this into a proper website. I resist. I put it off. I think about and don’t understand it. I don’t really know where this resistance comes from, but I will try to do better. What is it in your life that you should be doing but you’re not? My list is certainly longer than just get a proper website. That’s what’s bothering me today. I think you can only do one thing at a time. And I also think, you shouldn’t beat yourself up! Lol! There are so many things I should be doing, and I kick myself for not doing them. I feel a very close kinship with you on this topic. Mainly working on my novel and the countless side projects I have going on. Finishing university, working two jobs to pay rent, playing soccer, and housework all get in the way. You seem to be working on a lot more than me so kudos. I have the same problem with my blog / website.